Submitted by Dan Dooré on Friday, May 25, 2018 - 12:41. The year is 2991. The earth’s energy resources have slowly dwindled into nothingness. Man has been looking to deep space for the answer… And now, in a distance galaxy, a new crystal, ‘Dyzonium’, has been discovered. Scientist believe it to be a great source of energy. A piece the size of an old 23rd century moonbus will power a major city for a month! But there is just one problem… This galaxy is inhabited by nasty mutants from the 25th century intergalactic war. They hate visitors! This is why the people have hired you, Dr Zyzedd, the most notorious mercenary this side of Xzonia! Your mission, then, is to visit the 10 zones of this galaxy, collect all the Dyzonium crystals, and warp on to the next zone. On your travels look out for weapon power ups scattered about. Collecting them will improve your chances of survival. Yours is the mission … only you can succeed! Hooray! Rejoice in the streets and celebrate as… it’s ANOTHER Fred Publishing title! Three cheers for Colin! Dyzonium has been written by Balor Knight . If that name rings a bell somewhere, he was also responsible for Astroball on the SAM and Spectrum. The plot, as always, is remarkably ridiculous. It goes along the lines of “Earth’s energy resources are exhausted, so you have to go out and get the energy-rich crystals of Xzreyadia (you play Dr Zyzedd, or something) watching out for the 25th time bandit invaders of Xqiarhdfr (or Llandudno, or even Xzonia). I don’t know! Why couldn’t they call the bloke in the spaceship “Bob” and the baddies of “Planet X” or something? It’s hard to believe people get paid thousands to write this stuff! 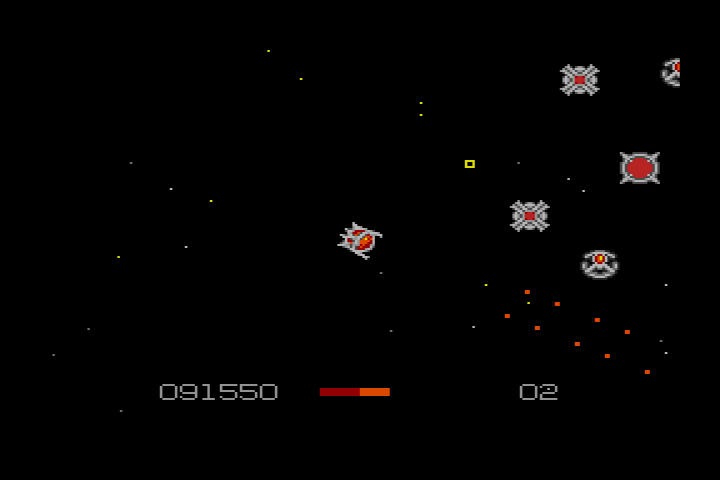 Anyway, to cut a long plotline short, Dyzonium is your average 8 way scrolly shoot ‘em up affair. 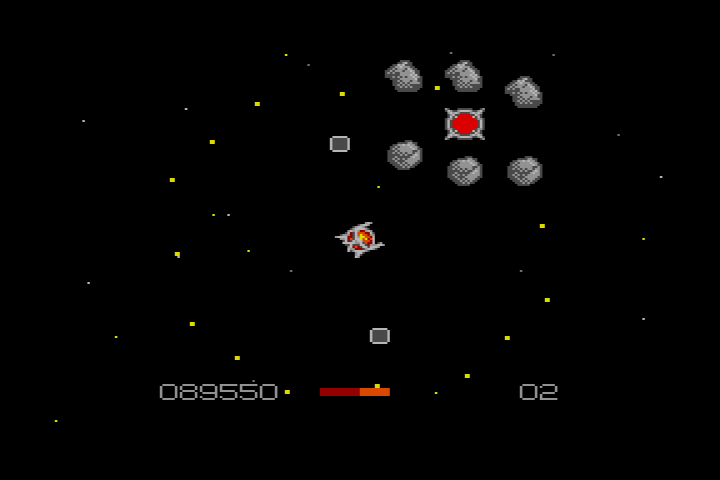 Most scrolly shooters on the Coupe normally have a moving starfield and sprites as backgrounds, as it is incredibly difficult to scroll backgrounds like in the many arcade games around. You control a spaceship which has to collect as many crystals, and zap out of the level, as possible. Obviously, the aliens from Xqiarhdfr are out to get you, as well as protect these crystals with all their might. This is where your laser guns come in handy. These double fire and move in the direction you move in. You can destroy most aliens with these, but others must be manoveuvred around to get to the crystals. 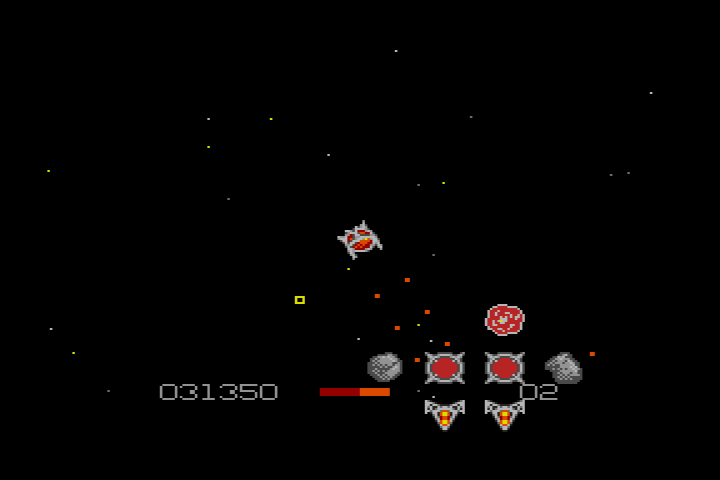 Icons replenish energy as well as firepower, and you can also use smart bombs to nuke entire portions of the screen. The music is fine and the graphics are colourful. So what is the problem? Speed? Nope - everything moves nicely, with no sign of slowdown. Gameplay? Nope - there is plenty of variety and stuff to do. Difficulty? Aha! Hit the nail right on the head! You only have one life for a start. One life against 10 levels and millions of baddies. Okay, so there is an energy bar, but all too often, you end up shouting “My energy was full a moment a go!”. It seems that some joker has put a colander in place of a fuel tank it seems, and the stuff is seeping out every time you play. After several completely painstaking hours of pain and pleasure, I had reached level two. Unfortunately, I died several seconds later, as an unrecognisable alien being crashed into my ship causing me to die. Oops! In my hurry to get acquainted with my new surroundings, I failed to notice the alien (which I wasn’t warned of much in the inlay instructions) which was (on a second go) indestructible. What is on level 3? A planet-eating god? The office doesn’t know - we haven’t got past level 2 yet! Coincidence is a funny thing; such is its nature. 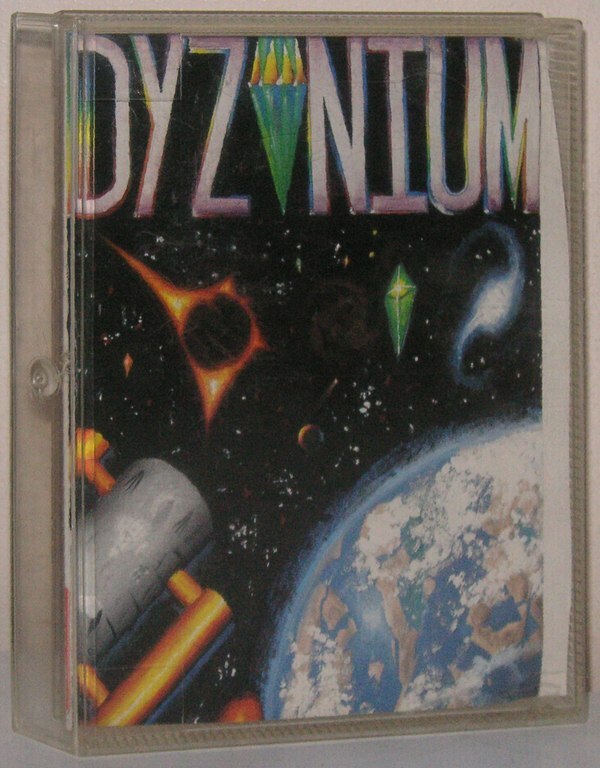 Dyzonium is almost identical to Bosconian '87, a Mastertronic arcade conversion of, erm, six years back. We are assured by the FRED people that programmer Balor Knight has never seen the Mastertronic game and that the whole thing is one enormous coincidence. Sounds fair enough. Dyzonium suffers from one of the worst plots of all time. Plots like this were outlawed in 1983. Storylines such as Dyzonium's have brought governments to the brink of fiscal disaster and caused grown men to break down and become commodity brokers for no readily explicable reason. Sit down and grip a close friend as I regale you with the gist of the inlay. Earth's energy resources have been depleted, so Dr Zyzedd sets out to gather as much of the energy-rich dyzonium crystals as possible. Out to spike his plans are 25th century time invaders from the universe of Xzonia. Right, it's all over now. Take a deep breath. Drink this glass of water. Isn't that better? Eight-way scrolling is the name of the game with Dyzonium. As (aarghh) Dr Zyzedd you fly a twistily manoeuvrable fighter with fixed-wing guns (so whichever direction you're flying in, that's where the bullets go). The crystals (and a number of power-up icons) are guarded by squadrons of baddies who zip around their little sectors of space with guns blazing. You have to pick your way among the various clumps of aliens, zapping or dodging them and grabbing the valuables they're hoarding. Easier said than done. Those fixed-wing guns cause no end of trouble, as you have to fly directly at an alien to score a hit. This is tremendously difficult. Even if you do shoot a bad guy, the resulting hugely destructive explosion can just as easily kill you. Pah. Throw away your joystick and get in plenty of practice with jinking your ship about is my advice. Balor Knight seems blessed with a great talent to create original and fantastically playable games, but cursed with the desire to make them unspeakably difficult. In Dyzonium you get one life (one!) and any hit saps vast amounts of energy. It's all you can do to stay in the skies for the first couple of hours. After that things improve, and you soon find yourself merrily sounding out the enemy defences, then taking on the smaller groups first to build up your powers before tackling the big boys. As in Astroball, things run at a constant not-zippy-but-fast-enough-to-keep-you-constantly-worried kind of speed. Awfully cunning. Of course, once you've had the phenomenally good luck to have shot down all the baddies and rescued all the crystals, you're then treated to the next level. There are ten in all. Nobody I know has passed Level Two. I mean, come on, even Astroball didn't get impossibly hard until about Level Five. The overall effect of playing Dyzonium is like taking part in a 2D Deathchase with moving trees that fire back. You don't have to approach any of the groups - you can quite happily flit about in the spaces in between. But they're just too tempting. After watching for a bit from a safe distance, you're compelled to rush in, blast at all and sundry and (inevitably) get killed. Then (equally inevitably) have another go. If only 'tweren't so instantly tricky, we could well have been looking at Balor's third Megagame. But it is, so we aren't. Bit of a pity really. Dyzonium was originally called Plasmoid, and a playable demo appeared on the SamCo Newsdisk 5 . From Spectrum und Sam Profi Club Type in “DIGITAL DREAMING” for cheat mode - see the scroller for details.